Have you ever read a book and known, just known, that you should like it, but you just aren’t quite getting it? 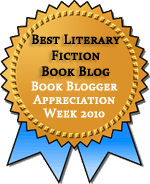 I’m not talking about those books we think we’re supposed to like because they’re highly acclaimed or popular; I’m talking about books that are doing everything right, that have qualities that you usually love, but that just aren’t clicking for you. I’ve just finished listening to Kim by Rudyard Kipling and read by Simon Vance, and I must confess that the experience was not a success. But in this case, I don’t think the book is the problem. The fault is in the audio format. I think I’ve mentioned before that I’m more forgiving of certain kinds of narrative problems when I’m listening to an audiobook. For example, when it’s difficult to flip back to previous pages, a certain amount of repetitiveness can be helpful. I’ve listened to several audiobooks, however, that I felt lukewarm about, and I wondered if the problem was not the book, but the audio format. With Kim, I’m almost certain that the format was at least part of the problem. Kim tells the story of Kimball O’Hara, the son of an Irish solider in India. Orphaned at a young age, Kim has spent his like wandering the streets, begging for food as needed, and doing odd jobs to earn money. He’s poor, but happy, and no one even seems aware that he’s the son of a white man. Early in the novel, Kim becomes the chela (disciple) of a Tibetan lama who is searching for a great river. Kim joins him on his travels, and before long, he encounters his father’s regiment. When the soldiers realize who Kim is, they decide to get him an education. Kim balks at the idea, but the lama makes sure that Kim gets the best education possible by paying for him to attend the best school available in India. So Kim becomes educated in the ways of his white forebears, all with an eye to someday getting involved in the Great Game of spying for the British Empire. When he is on school breaks, he hurries back to his former life on the road, where he gets some firsthand experience and specialized training in spying that the schools would not provide. Given that this is a story of travel, adventure, and espionage, one might expect lots of excitement and suspense. This expectation is one of the reasons I thought Kim might be a good choice on audio. But I found Kim to be more meditative, filled with the lama’s musings on the Wheel of Things and the elaborate descriptions of the people and places Kim encounters during his many travels. The bits of adventure are subtly presented, requiring one to read between the lines in a way that is difficult to do with an audiobook. There were several times that I didn’t even realize that I was seeing espionage in action, and because I was listening instead of reading, I couldn’t go back and see exactly what happened once I got a sense that I’d missed something. I know I lost several plot threads entirely, and it’s not like the plot was really complicated; it’s just not presented in a simple, obvious way. The other challenge had to do with the setting. The locations, names, religious ideas—everything—were almost entirely new to me. This made it harder for me to follow the plot or understand the character relationships. It’s not really that the book is difficult. I don’t think I would find it so in print, but the unfamiliarity requires a closer sort of reading, especially in the early pages when the scene is being set and the characters introduced, than I can get with an audiobook. So I’m left with mixed feelings. There were parts of the book that I absolutely loved. When Kim first met his father’s regiment, I was riveted. 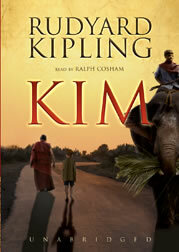 And the relationship between Kim and the lama, really the heart of the book, is moving and lovingly presented. I found the interrelationships among the many different cultures of 19th century India to be fascinating. I could tell that this is a rich book, but I felt that I was just skimming over the surface with my listening. I’m left wanting more, but I think the more is there, in the printed pages of Kipling’s own classic. I’ll have to give it another try someday and see. I do hope you give it another try someday! I loved Kim when I was younger, probably stemming from a passion for Kim’s Game at Brownie meetings. My father used to read me bits of it before bed when I was very little and then, once I got older, I read it on my own and adored it. All of this began my very politically-incorrect, life-long passion for stories of British colonialists in India. Claire, I do intend to give it another try. It might be years before I get back to it, but it did seem like a good story, just not one suited to the format, or perhaps my mood. I don’t think I ever realized what this book was about. It does sound interesting. Jill, Isn’t it funny how we hear about certain books all the time and never really know what they’re about. This is an interesting one. Eva, I feel sure I would have liked this more on paper, and I rather liked the ending, although I also found it to be a slow start. I haven’t listened to very many audio books in recent years, in fact only two: Persuasion and, as coincidence would have it, Kim. How bizarre is that? I downloaded it from Audible for free as part of a promotion via the Book Depository early last year and listened to it on my walk to work in the morning. I enjoyed the experience immensely, in part because I had no preconceptions about Kim and no idea what it was about, and in part because the experience of listening to a book was so refreshing. And I totally agree that this isn’t what I think of when I think of children’s books. I wonder what children today would make of it. I tried listening to the Librivox (free) audio of this and I got through about a half an hour before I was bored to death and abandoned it. I’ll try again in the text because it sounds that there are some good things about it. Rebecca, There are some good things in it, but I do think it would require a very good narrator to work at all in audio. I’ve never tried a Librivox recording, but I understand the quality is uneven. Teresa, I listened to some well done books (Woman in White was 95% excellent narration and Pride and Prejudice was a good book even with mediocre narration lol) but this one I don’t recall a thing about the narration. I was just plain bored. I loved this book as a child, read it several times. I haven’t tried it again as an adult, but feel it would be one of those that holds up well to that re-reading. Jeane, This does seem rich enough to reward multiple readings, and to be equally rewarding for adults as it would be for children. The only things I read by Kipling as a kid were the Just-So Stories, and then I got a bit older and found out about his aggravating views on women and colonialism, and I’ve boycotted him ever since then. (Except the Just-So stories, which I confess I still love.) I always thought if I were going to unshun him, Kim would be the book to read – maybe not though? I wonder if Kipling is one of those authors that is best read when you are young and then you can fondly remember the stories for the rest of your life. My only Kipling is the Just So Stories, which were okay (read at around age 10), and The Janeites, which I wanted to love, but just couldn’t. I recently listened to To the Lighthouse (my first reading of this classic!) and was glad I chose this format as I think listening enhanced the experience, but I agree that with a book that is chock full of unfamilar names/place, audio is challenging. Jane, Hmmm… I actually think I would have liked this in print. But maybe not. I can’t imagine trying Virginia Woolf in audio, but I still haven’t made friends with Woolf after loathing Mrs Dalloway in college. I think this is one I would have to read rather than listen to. I’m not all that good with audio books as it is. Kathleen, I’m pretty good with certain audiobooks, and I really do think the format is forgiving of certain kinds of problems (repetitiveness, predictability). But I found this to be tough. I know you picked this up partly because of Laurie King’s The Game. I can also highly recommend another book she mentions in her bibliography: Peter Hopkirk’s nonfiction The Great Game. It’s long but absolutely worth every page! Jenny, This had been in the back of my mind as something to read for years, but yes it was Laurie King that caused me to finally get around to it. I wonder if the Hopkirk would help me appreciate this more. Perhaps I’ll tackle it before revisiting Kipling.